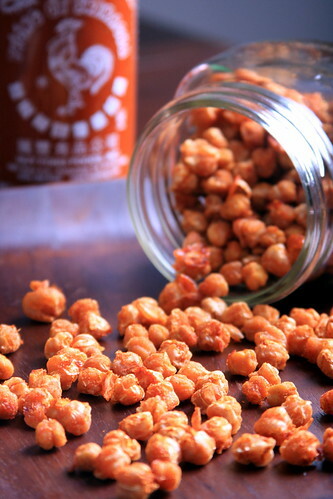 Chickpeas and sriracha taste amazing together. I originally wanted to douse these these chickpeas in sriracha and roast them but, last week, the igniter inside our oven broke, so I used my dehydrator to dry them out instead. After about 10 hours, they emerged from the dehydrator smelling and tasting fantastic, but the texture was still slightly too chewy. So I threw a handful of them into a saute pan with some oil which transformed them into a perfectly crispy and addictive chickpea. Store the dehydrated chickpeas in an airtight container (they’ll last about a week) and throw in handfuls of them into a saute pan as you’d like (they taste best straight out of the pan). Rinse the chickpeas well and place them on a kitchen towel. Pat dry. Place the sriracha and salt in a large bowl. Add in the chickpeas and coat evenly. Sprinkle with the sugar and transfer to a dehydrator tray lined with a fruit tray. Set at 130 degrees and dehydrate for for 10-12 hours. To saute them, add a little olive oil to a saute pan over medium-low heat. Throw in a desired amount of chickpeas for a minute or two only, shaking the pan to prevent scorching. Serve warm or at room temp. I must have these! Need to get myself some more sriracha or borrow from the parents.. This recipe might get my dad to not hate chickpeas! These are also really good baked but not crispy too. I put them in my salads and they're spicy and delicious. Baked marinated chickpeas are always delicious though.